With the increasing number of Samsung NX camera and lenses, I was planning to purchase a smaller camera bag to house them while I travel around. Currently I used my normal messenger bag and backpack to hold them, but this is definitely not the safe and rugged way to transport camera equipment. Yet I like to use my normal bags because they come with lots of compartments to put my other non-camera stuff. Then I remembered a few years back I saw some huge padded compartments going for sale. I figured such products should be available online. The challenge is to find the right keywords to google their existence. With some luck, I managed to find the items in Gmarket Singapore using the words as listed in this blog title. Fitting the padded inserts into my haversack. It appears only a few “major” brands sells such life-saving products. One of them is called Puleme from Korea. There are lots of sizes to choose from. The general mentality is of course, to get a partition as big as possible, so that you can put more equipment. But if the partition is too big, it would not fit into the bag. While the messenger bags are generally broad and short – like 40cm – haversacks or backpacks are narrow and tall – like 25cm. My decision is to get one size to fit all bags, so I chose the model P7518 (exterior dimension L26.5 x W10.5 x H21cm). I placed my order on 25 Oct via Gmarket, opted for registered mail, and I received the postal pickup note on 2 Nov. That was blazing fast! 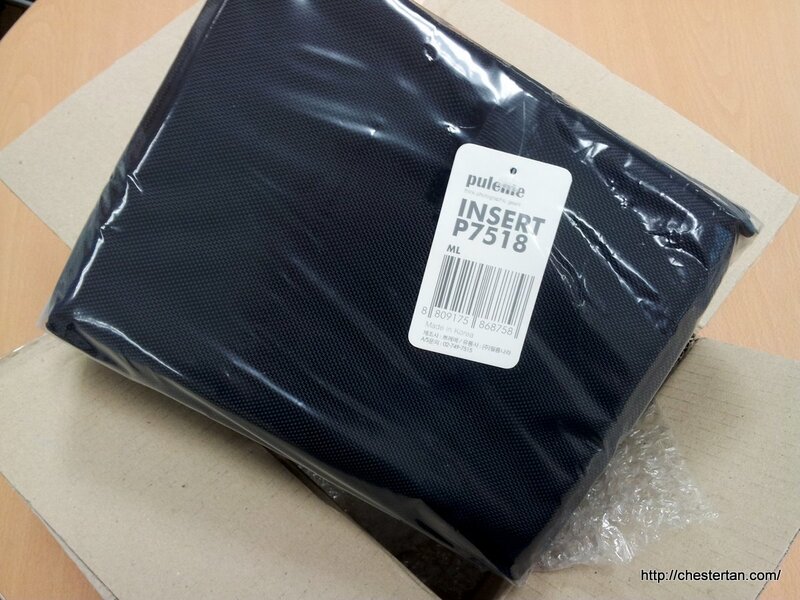 The item is packed in a box parcel, which ensures the product will not be crushed during shipment. New Gmarket sign-ups will get $1 discount coupon, and if you connect your Gmarket account to Twitter or Facebook, you get another $3 discount coupon! Note that Gmarket has many sellers, just like eBay. In fact, Gmarket is supported by eBay. Oh, forgot to mention. My total bill for this purchase, including $3 and registered mail: S$15.32.